Muhammad Hadi, 21, is an examplary student who is excellent in academic, and a role model who inspires other students. He is currently in the third year of his Bachelor’s degree in Law and Syariah in Universiti Sains Islam Malaysia (USIM). He was born to Encik Darus Dariman and Puan Halimah Che Pa in Hospital Gua Musang, Kelantan on 22 Julai 1996. The second offspring out of five siblings, Hadi and his family are currently residing in Pendang, Kedah. Q1 What is your secret to reach this level of success? Ever since I started going to the kindergarten at the age of five, I always keep my motivation high by telling myself that I can be as good as everybody else. I can also achieve what other people can do. Knowing that I have been living in a comfort zone with my family since I was small, I consciously made the effort to join a camping program to stretch and grow myself in a more challenging condition, without the help of my family. During the camping trip, I managed to do everything with the help of my friends. At first, even a simple and mundane task like putting on my own clothes was very challenging for a differently abled person like myself. But the next time round, it got easier and soon I was able to carry out most tasks smoothly. Alhamdulillah, I was able to complete the camping program successfully. This had further bolstered my self-confidence, that it was time to be more independent. After achieving 9A in Penilaian Menengah Rendah (PMR), I was accepted to study in SMKA Kedah, Alor Setar in Form Four and so, I stayed in the hostel. It was difficult in the beginning, but with practice and experience, I was able to adapt to a student’s life in the hostel and school. Alhamdulillah, I achieved the result of 11A in Sijil Pelajaran Malaysia (SPM) and proceeded to the next stage of education by enrolling in the Tamhidi program of USIM. In life, it is very important to seek blessings, especially from your own parents and in the path of knowledge. Some of the things that we can do to show respect to our parents are to greet them by kissing their hands, and if we stay in the hostel, to always keep in touch by calling them. Good adab with parents is more than speech and actions, we also have to pray for their wellbeing. Q2 What is your plan and ambition, Hadi? I studied in the science stream during my upper secondary school. However, when I registered in the Tamhidi program, I decided to switch field and chose to undertake the Syariah and Law studies instead. I made this decision because I realised that I might face relatively more hardship in the field of science especially when I enter the workforce. I wish to be a Syariah and Law lecturer because I would like to disseminate knowledge to other people. Q3 How do you view USIM’s role in providing support to differently abled students? In USIM, the welfare of students like me are taken seriously. The university had renovated a housing unit in Kolej Kediaman Nilam Court to suit the needs of differently abled students. Among the modifications done were the lowering of the electrical switches and plug points in order to make them accessible to differently abled students like me. As a result, we face no difficulties reaching for the electrical switches and plug points to switch on the lights or to use our laptops. Water pipes were also lowered and they had ensured that the floor is level with no steps to make it wheelchair friendly. I have no issues staying here since I have experienced life in hostels since I was in Form Four. I’m sharing with three other differently abled students in this housing unit which has three bedrooms. Although the housing unit is relatively far from the USIM campus, which is about 8.5 kilometer away, I have no problem going to lecture halls because USIM has assigned a staff to pick me up every morning as well as send me back on a daily basis. However, if I have a lecture at night, I will choose not to go back to my room in the afternoon and will spend the time revising or reading in the surau until the night class begins at 8 or 9 pm. Q4 What is your achievement that you’re most proud of? I was awarded with Anugerah Maulidur Rasul at the national level in 2012 on account of my excellent academic results for the PMR exam (9A). I was also honoured as the best student for Sijil Pelajaran Malaysia (SPM) 2013 with my 11A result in the Special Needs Candidate category. Having made it to the university despite my adversity, Yayasan Pelajaran MARA (YPM) named me an icon and frequently invited me to give motivational talks to youths and students. I enjoy meeting other students and share the struggles and joy in the journey towards success. I would tell them – if I, as a differently abled person can succeed, the normal students can achieve success too. So far, I have given 20 motivational talks. 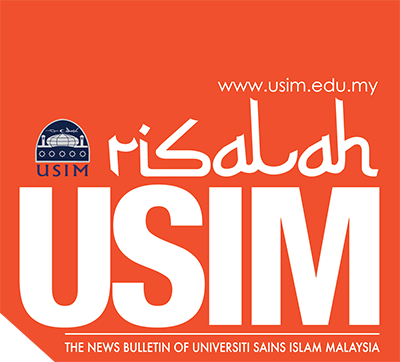 Q5 What are your hopes and advice specially for USIM students? What I can share with USIM students is this – if we are lacking in something, people will not see it if we are successful. Success is not defined by material wealth; but instead by the number of people whom we have helped or inspired to change for the better. Everybody dreams of success but not many would work hard to achieve it. Each one of us has a role to play as an agent of change in the society. Therefore, strengthen your resolve in every single thing that you undertake and keep moving forward, one step at a time. Our dreams might be belittled by others but take no heed, and use those as fuels to keep your spirits soaring high. My journey in USIM is far from over; I’m not even halfway through my five-year study yet. However, I would like to prove that indeed – where there’s a will, there’s a way. When our mind is set to achieve something, there would be no stopping us, insya-Allah.